ZOTAC International, a leading innovator and the world's largest channel manufacturer of graphics cards, motherboards and mini-PCs, today announces the ZOTAC DisplayPort to Dual HDMI and mini-DisplayPort to Dual HDMI adaptors designed to double display output capabilities on desktops and notebooks. The ZOTAC Dual HDMI adaptors transform native DisplayPort and mini-DisplayPort outputs from notebooks, desktops - graphics cards and integrated graphics - to dual HDMI outputs. 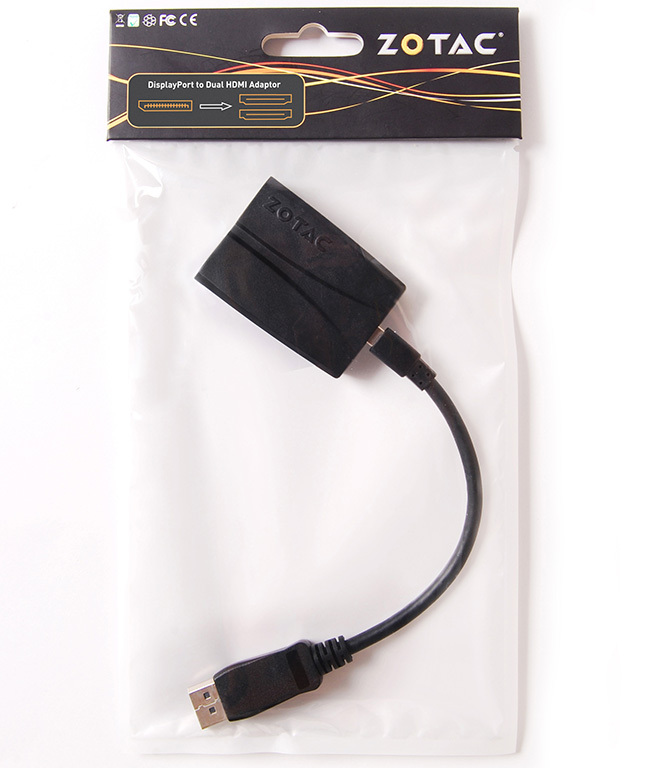 The HDMI outputs are capable of resolutions up to 1920x1080 per port for a combined spanned resolution of 3840x1080 with the ZOTAC Dual HDMI adaptors. "Multiple monitors are becoming quite popular for day-to-day tasks. Users can expand their system to triple displays by combining a laptop display, dual display-capable graphics card or motherboard with a ZOTAC Dual HDMI adaptor," said Carsten Berger, marketing director, ZOTAC International. 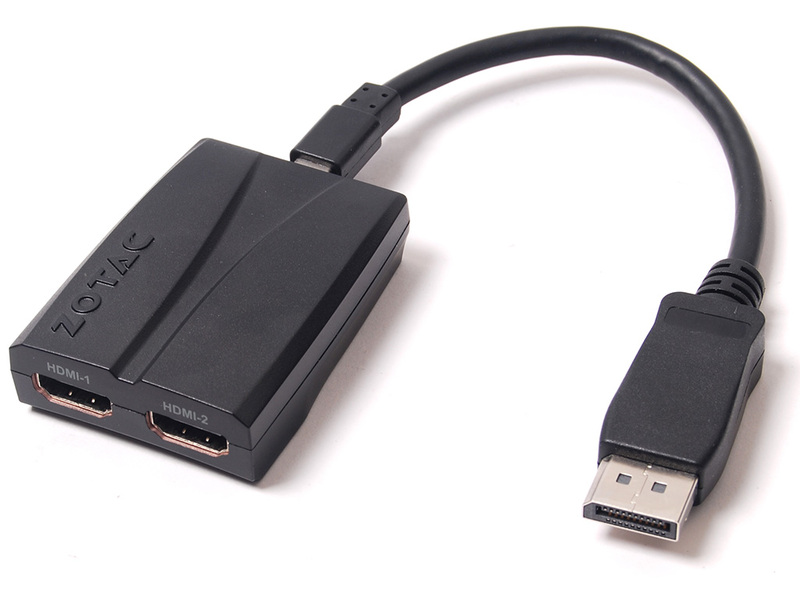 The ZOTAC Dual HDMI adaptors are completely passive and do not require additional cabling for power - just plug the DisplayPort or mini-DisplayPort cables into the adaptor and instantly have two 1080p capable HDMI outputs." 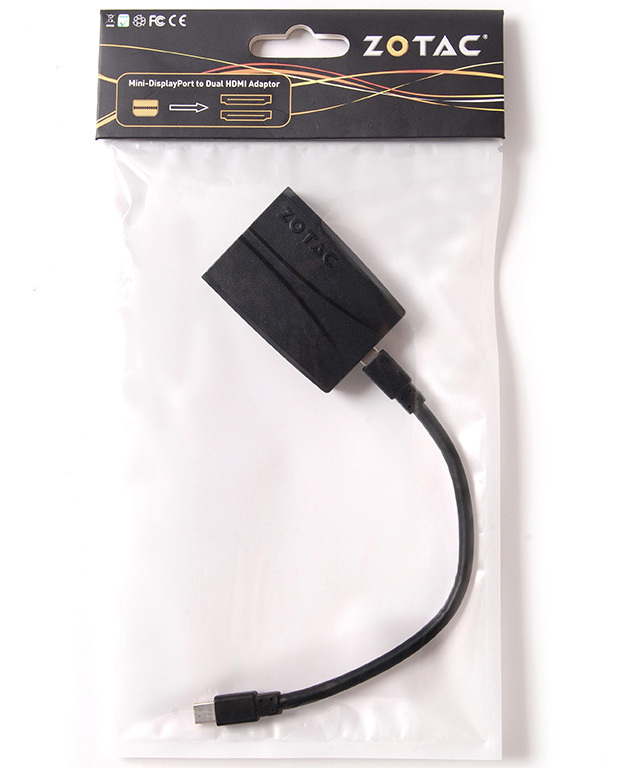 It's time to play with the ZOTAC Dual HDMI adaptors. Is there really enough bandwidth on HDMI to make this work correctly ? @RD5TUFF, post: 2358240"]Is there really enough bandwidth on HDMI to make this work correctly ? From display port to drive 2 1080 dispalys? I meant without fun things like artifacting, I dun know just seems like it might turn out wonky. My initial thought is that this could simplify eyefinity setup, or am I off base? seems to certify displayport's non viability? Cool. Just surprised they don't say that in any of their marketing material. Well can you see the point in the device for anything else ? No, but my point was not what I see. It's about marketing majors missing an obvious chance to state the obvious. Yeah it seems to suffer from bad marketing. The real question is, will it be compatable with my 5850? Honestly I doubt it will work with old tech. The 58xx series (minus the 6 monitor output eyefinity cards) can only support 3 monitors total. 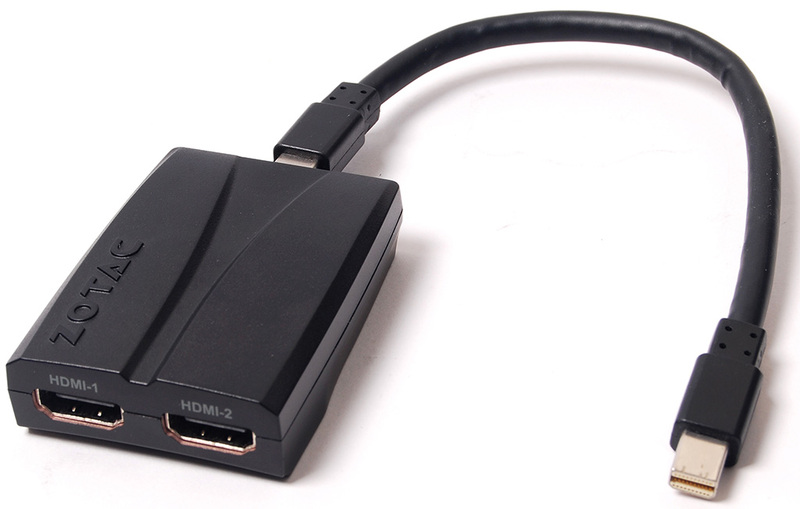 I could see the DP outputting 2 hdmi monitors as a passive output. This would prevent a third monitor. But who knows, maybe amd will release a driver to let us use 4 monitors with our "old tech". So this is going to have to work with the drivers for whatever chipset or video card it's attached to? Oh yeah, that sounds like hours of entertainment. Best check the compatible hardware list before buying. And even then . . . .
What's the proposed MSRP? Give it time, the design or something similar will probably end up on Monoprice. its designed to make it look like a single, twice as wide monitor. If you have fisheyes, you could run three of these and eyefinity for a 6 monitor setup. Oh, he meant that literally? I just figured it was some kind of Australian slang. I think my normal eyes could easily handle 6 monitors as I have nearly 170 degrees of peripheral vision. i meant fisheyes as in extremely wide vision, 6 monitors would cover a huge area, per my original comment. I guess you've never seen some of the trading stations people have set up. 6 monitors is a minimum.